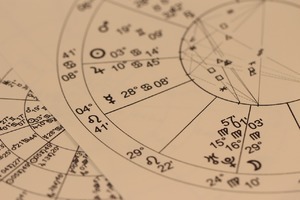 Astro-Numerology Horoscope is based on date of birth, time of birth and name. The analysis is calculated by me and not computer generated. The Horoscope includes: Natal birth chart report, planets position, houses and their characteristics, determination of the ascendant, descendant, MC, IC, aspects, numerology analyses as Star code, number vibration of birth day, determination of life’s periods, numerology analyse of names, karmic karmic predictions of present and past lives, influence of the Sun Sign on the vibrations of names and the day of birth, determination of available or not available temporary karmic restrictions for marriage, Pythagoras Matrix, astrological analyse of Sun sign, determination of Moon day on birth horoscope, numerology analyse of personal years, health information according of Sun sign, suitable crystals and stones, colours, lucky numbers. Astro-Numerology Horoscope is а combination of Astro Birth Chart and Detailed Numerology Horoscope. Such combination provides the fullest and detailed picture of all elements in the character and temperament, vibrations, powers and energy that influenced the reception, behavior, thinking and driving motives. The Astro-Numerology Horoscope is suitable for everybody who wish to know deep itself. Your birth data is analysed from a psychological, spiritual, genetic and karmic perspective in a written reading which you can receive to your email or posted printed and bound to your address. Term of performance of the order: 15-20 working days.